1. Runny nose- ask our doctor to prescribe a nasal spray. 2. Pain in our side-do things at a slow pace if still pain we should visit our doctor immediately. 3. Red Face-splash water on our skin and exercise in a cool area. 4. Hives-ask our doctor to recommend an Antihistamine. If we are taking one that causes drowsiness, we should take before your bedtime. 5. Sudden urge to go-we should request our doctor to write a prescription for incontinence pants. 6. Pain in our ribs-see your doctor immediately for probably just muscle strain and rest until the pain dissipates a few days and lessen your future exercise but, rule out any more serious problems. I had this occur because my former doctor told me to exercise more-one of the reasons he is my former doctor. 7. Pain around our Heart-see your doctor immediately for probably also just muscle strain and rest a few days until the pain dissipates and lessen your future exercise but, rule out more serious problems. 8. Doing a very strenuous activity outside in the heat-be sure to stay well hydrated and be sure a defibillator is on hand if we pass out. I once witnessed a child pass out and he was well hydrated. 9. Constipation-stay well hydrated especially with the heat of summer. Pepto Bismal is good for constipation or diarrhea If needed still seek our doctor. 10. Our knee can fill with fluid from bending down to low to exercise with our prior injury; go immediately to our doctor and have surgery to remove our fluid. Hopefully, we will not have these occurrences but, I want us all informed. I wish you all a very safe and wonderful summer and those that have winter now in their part of the world please, be careful shoveling and take rests-go inside for shelter when resting-it is better to slide your shovel then to pick it up. 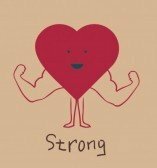 Please, all do Heart Strong Proper Exercise. Please shop our Heart Strong or Cancer Free Smart Shop and buy our select USDA products that were tested and highest rated by leading world scientists at Good Guide. If you subscribe to our service of weekly, monthly, etc we can discount greatly. Also if your order regularly and enough shipments there will be no shipping charge. In closing, please, kindly forgive my error that my son posted his published (eight days early) E-book, “Symbolism and Psychology” at our Smart Shop-he did not do it as yet-he is in the process; I will always check and verify myself for now on-we had miscommunication since he rushed to publish his E-book, "Symbolism and Psychology" on Phi Beta Sigma’s website (and immediately many copies sold ) and he also rushed to put his outline on my Pinterest Page Artist Barbara Alsieux Fine Art Studio ( no affiliation to our charitable organization), before he rushed off this weekend as a Delegate to a Phi Beta Sigma convention and had to pick up many members on the way. I will verify myself and post when it is at our Smart Shop.